You know having a baby is a life changer, but what will it really be like after you bring your little one home? Your newborn baby might have a few surprises for you. To help prepare you, here are 10 things to know about those first three months with baby. Newborn babies have teeny-tiny stomachs that fill quickly but also empty rapidly. Which means your little one will want to nurse or take a bottle every two to three hours, and more often during a growth spurt. That's a lot of time spent eating! It will quickly feel like all you're doing is nursing or feeding your baby. And that's exactly how it should be, because your baby is aiming to double her birth weight by about five months old. Don't worry, soon your baby will be able to go longer between feedings. Besides eating, a newborn's primary other activity is sleeping. A brand-new baby sleeps 16 or more hours a day, so it is possible for new parents to get some sleep as well. It just won't be at the usual time, particularly if your little one is day-night confused (see the next slide). That's why it's important to adhere to the old adage "Sleep when the baby sleeps." Seriously! In the first few weeks after birth, many newborn babies get their days and nights confused. This means they tend sleep all day, and not so much at night. 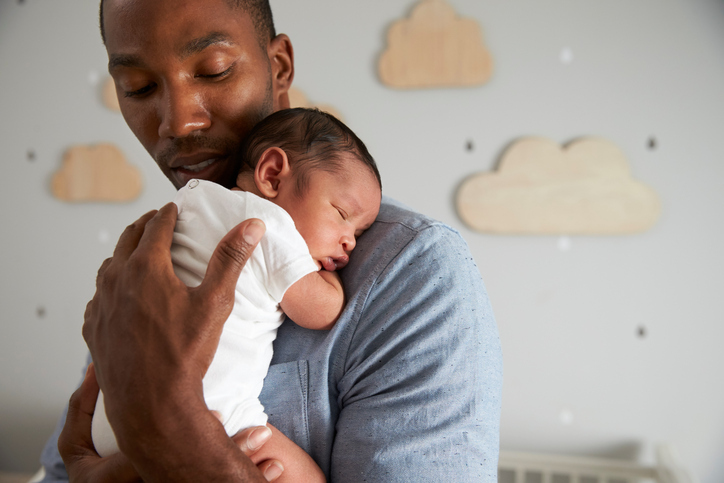 Although they will work it out eventually, you'll want to help him get there sooner by keeping your little one awake more often during the daylight hours. There's the crying, of course, but nary a new mama hasn't been surprised by the grunts, slurps, and farts of her infant. Would you ever think such a tiny human could make so much noise? Expect your newborn to be a noisy little thing, because they almost always are. During these first few months of interrupted and too-little sleep, you might feel like you're in a fog or daze, forgetting where you set down the bottle and losing your train of thought midway through a conversation. That's the effect of sleep deprivation on most people. In fact, researchers have determined that getting too little sleep is the equivalent of being drunk. Keep that in mind and don't make any major life decisions or purchases during this time. You're really not in your right mind, mama. Your body spent nine months growing a baby, and that included plumping up your chest. But that blossoming probably won't compare to the swollen, tender, and even hard breasts you'll experience once your milk comes in two to five days after you deliver. That engorgement, which can be painful, is normal and can be eased by nursing, and with ice packs between feeding, according to the Mayo Clinic. If you're planning on breastfeeding, say hello to your big new friends; they're here to stay. Moms who aren't breastfeeding will want to wear a sports or other supportive bra and avoid stimulating their breasts. Even the sweetest of newborns seems to store up great swaths of fussiness to release in the late afternoon or early evening. For many moms, the witching hour falls right about the time they're trying to piece together dinner, which becomes monumentally harder when you have a newborn screaming in your ear. Anything you can do to prep for this time will work in your favor. So start accepting those offers from friends and family to stock your freezer with heat-and-serve casseroles. A new baby is bound to change the dynamic of your relationship; after all, you're going from being relatively carefree partners to being parents, with all the responsibility and work that entails. It's a huge adjustment, and everyone deals with it differently. Your partner might dive into the new role with zeal and provide endless support, while others need some time to warm up to being a parent. Ecstatic one moment, melancholy the next... it's normal to feel moody and emotional in the first few weeks after you deliver. Postpartum depression affects as many as 15% of women, and is a serious condition that often requires treatment; talk to your partner and contact your doctor if you start feeling hopeless, overwhelmed, anxious, or sadness that lingers. Even more common are the "baby blues," described as feelings of unhappiness, worry, and exhaustion that four out of five new moms experience. You can expect to shake these blues within a week or two. Your newborn will quickly develop beyond the "fourth trimester" and become a baby, then a crawler, then a toddler, then a tiny talking person... the time goes by fast, and your brand-new baby will never again resemble anything like the sweet-smelling, totally helpless creature you're doting on now. Love it or hate it, this stage will be over before you know it.